The Mama now has 5 boys so I used 5 as the theme. My own baby shower was a fox theme, to go with my nursery. Pick a theme Mama loves and you’ll be good to go! Once you have a theme (even if it’s just blue for a boy or pink for a girl), it’s fun to put together the party. Everyone loved the food, games, and prizes. Here’s an overview of what I did with my tips. There are various recipes, but all you really need is pop and ice cream (or sherbet), and you can add whatever juice you like. 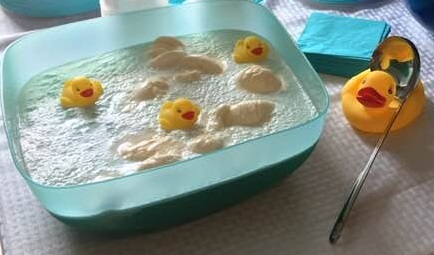 You drop scoops of ice cream into the punch/juice mix, then pour the pop on top last so that it gets foamy (like root beer floats) and looks like a bubble bath. I used Polar Blast Hawaiian Punch because it’s blue, but I think a packet of blue Kool-Aid or blue food coloring would work better. The Polar Blast punch has sucralose so it leaves that weird aftertaste. I also used white grape juice, but the flavor didn’t mix that well. And I don’t think the color matters…the foam covers it up and I used a blue bowl anyway. So if I did this again, I would use: Juicy Juice Fruit Punch, rainbow sherbet, and Sprite. It’s a lot of sugar so another option is use club soda instead of Sprite. For the ducks, I bought a set of 3 with a larger holder that made a nice ladle rest. I got it at Hobby Lobby but you can find these lots of places, like Walmart (in the baby section), or Amazon. I first had these at a wedding probably a decade or so ago, and vowed I would one day make them. 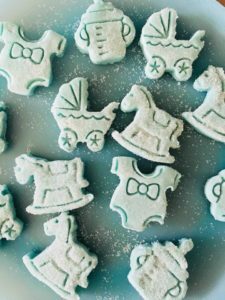 I found a baby-themed fondant cut & press set (at Hobby Lobby), and I wondered if they were too big, or if they’d even work for mints. They were only $2.79 so I didn’t have much to lose! People generally press the mints into small molds in rose or leaf shapes, but I really wanted the adorable baby theme so I tried it, and it worked great! I discovered the secret to perfect shapes is sprinkling a thick layer of granulated sugar on top before pressing. Also, you can do any flavor…it doesn’t have to be mint (or peppermint). I’m going to try vanilla almond at Christmastime. I rolled the extra dough into 1″ balls then rolled them in granulated sugar, then pressed them with a fork. The recipe makes quite a lot so they keep well in the freezer. Mix cream cheese, butter, and extract. Add 1 cup powdered sugar and food coloring a few drops at a time. Gradually add the rest of the powdered sugar. Place in plastic wrap and refrigerate for 2 hours. Place between 2 sheets of parchment paper and roll out to 1/2″ thick with a rolling pin. Remove top paper and sprinkle a thick layer of granulated sugar over the dough, then punch out shapes. Roll leftover dough into 1″ balls, roll in granulated sugar (in a bowl), then press with a fork. For prizes, I ordered Fragrant Jewels bath bombs when they had a special offer on Facebook for a set of 4. This way I could have 1 for each winner and 1 for the mama (and I added a fifth one for myself to get free shipping, hehe). There is a beautiful ring inside of each, and a chance that it’s worth $10,000, so it was really fun having the possibility of a giant grand prize. I used mine before the party and it smells AMAZING. I got the pink champagne ones because the rings are so pretty (and they would be great for a girl baby shower, but I just wrapped them in blue tissue paper from Dollar Tree with gray ribbon bows). I had 5 flavors in honor of her 5 kids. Just remove the labels and number them. I chose a green (could be peas or green beans) and an orange (could be carrots or sweet potatoes but it was actually mango), and 3 light-brown which were: Strawberry/banana, pear/raspberry and turkey. They got a point for every flavor they could identify, so there were 7 possible points. I had popsicle sticks for tasting but I let them know they could also just smell it if they were too afraid. Watching them try the meat flavor was pretty funny to watch. Each jar was about 60 cents, and the popsicle sticks were less than a dollar for a pack of 50. I came up with a dozen multiple-choice questions about the Mama and her family, ranging from how much the new baby weighed to her favorite food to eat while pregnant. She absolutely hates meatloaf so I made them deduct a point if they chose that answer, which made it more fun. Only I had the questions so this kept everyone together (instead of reading ahead on their own). For extra credit, I had them match the middle name to each child. Another fun question was which song she would prefer, so I chose songs with Baby in the title, from different music genres. I also warned them beforehand that some questions had multiple answers (such as mama’s favorite place to shop, where her children were born, etc. ), and awarded a point for each right answer. 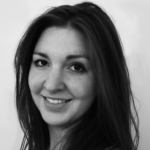 I also threw in ridiculous answers for fun, like… “Where did the parents meet? A) online, B) at school, or C) when he pulled her over for speeding.” So all you need for this game is paper, pens, and knowledge of the Mama! I gave everyone a marker and a paper plate, and they drew on top of their heads. I had them draw the new baby with a teddy bear and a bottle. I was impressed with how well they came out! I kept them anonymous and had the mama choose her favorite for the winner. 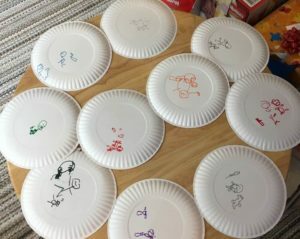 All you need for this game is a pack of markers and paper plates…so easily under $5! Three games was plenty before we got to the gift-opening, as the final activity. I pictured a giant number 5 balloon hanging from the ceiling, but I got the wrong size, so check the dimensions before you buy! However, the smaller ones are perfect if you want to spell out the baby’s name or something like ‘OH BOY’ or ‘OH BABY.’ In hindsight I wish I had also bought a bunch of balloons to put outside for people to easily find the house. That’s like party planning 101. I love these inexpensive and adorable balloon sets from Amazon! I made letter blocks with the baby’s name for a table centerpiece. 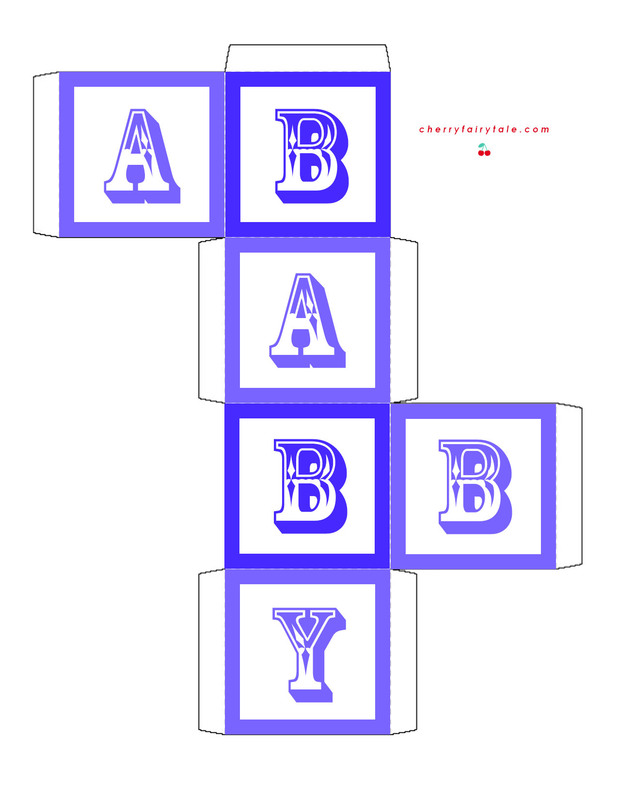 You can print these blue or pink blocks that spell ‘BABY’, or if you know Photoshop, use one as a template to personalize it with the baby’s name (the font is Rosewood). I glued them to cereal boxes (with rubber cement), cut them out (with an X-acto knife), scored them (with a bone folder), and glued them (with hot glue). 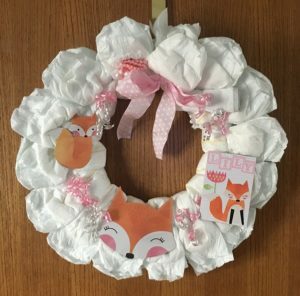 Another cute, fun, and easy-to-make decoration is a diaper wreath. 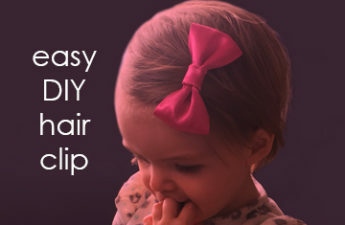 Here’s the detailed how-to post! All you need is a package of diapers, a wreath frame (get it at Dollar Tree! ), some ribbon, and embellishments. Don’t use glue because the diapers can still be usable, which also makes it a nice gift. 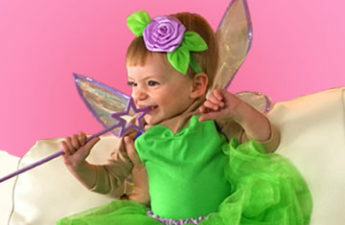 The embellishments can be gifts too…small items like a rolled up washcloth, baby socks, toys, etc. Here’s a picture of the one my mom ordered on Etsy for my baby shower. Have you or will you use any of these ideas? How did it turn out? Let me know with a comment!